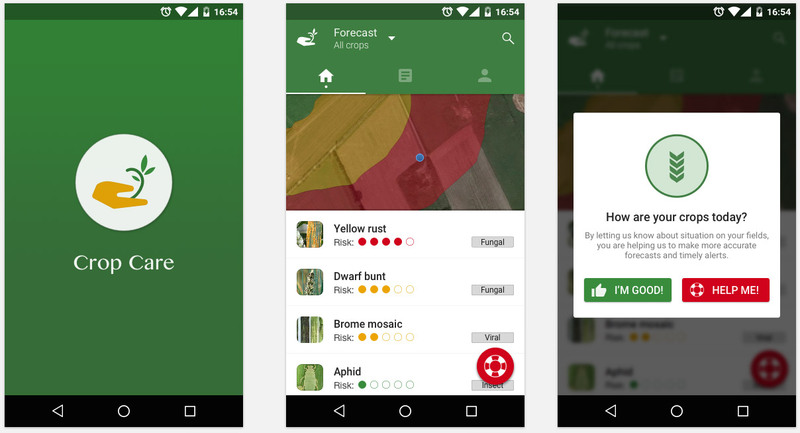 Crop Care is an Android based application, created to meet the challenge of providing an accessible and reliable service to minimize the risk of crop loss from pests and diseases to crop growers and farmers. It is an early alert, collaboration system and knowledge base for crop growers. It helps farmers prevent possible pest and disease threat via collaboration and awareness. Benefits: minimization of crop loss risks, sustainable plant protection product allocation, experience exchange. Our service facilitates efficient crop care and yield improvement through analysis, advice and timely alerts based on crowd-sourced crop pest and disease data. Some features are: Threat risk zone and severity visualization. Crowd-sourced information on threats. Knowledge base. Forecast and Alerts. This module provides a map overview of local area with a visualized forecast of possible threat zones and a list of the possible threats. The forecast is initially based on open-source historical data about past threats for the region, but every submission of feedback from our users corrects the forecast. Survey and Feedback. Facilitates feedback from our users by regularly asking them to reply to a simple question and provide quick data on their problem. By providing the feedback user will verify the precision of our forecast and will provide us with crowd-source data to build more accurate forecasts and timely alerts. Knowledge base. 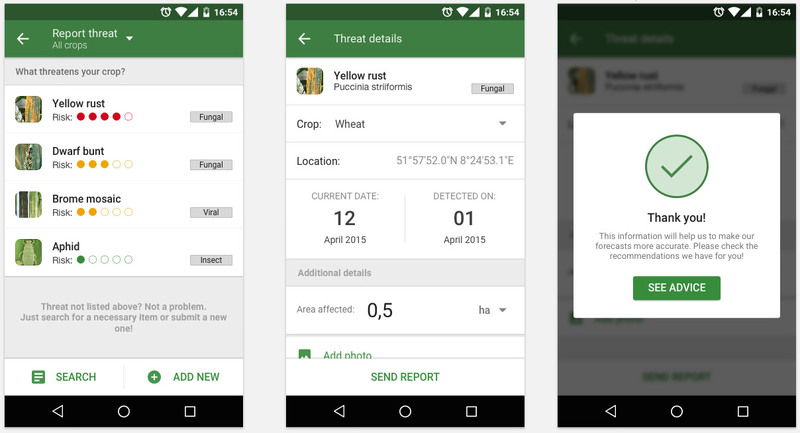 A searchable and editable database, which provides user with information on all kinds of pests and disease, and ways to protect their crops from them. Initially will contain open-source information. It will be used by our users to quickly identify the threat and receive recommendations on dealing with it. Users will be able to comment and create new entries to the database to share and exchange their experience.